You’ve heard of ‘Pin It To Win It’ contests on Pinterest. 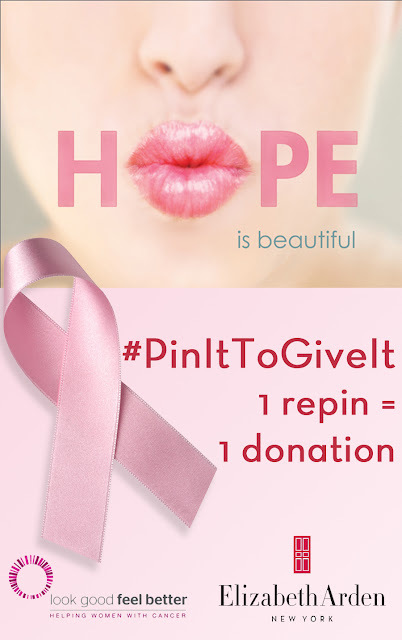 Now, Elizabeth Arden revolutionizes social giving with Pinterest’s first-ever ‘Pin It To Give It’ campaign to help women in the fight against cancer. The iconic beauty brand is in the midst of a spa-inspired repositioning that’s transforming and modernizing the look and feel of the brand across every touch point. And through October, Elizabeth Arden is making being a ‘do-gooder’ as simple as selecting the “repin” button on their newly launched, official Pinterest page. techniques for managing the physical side effects of treatment. For every image repinned from Elizabeth Arden’s ‘Pin It To Give It’ board, the beauty brand will donate one Elizabeth Arden eyeliner to the charity with a total of 10,000 eyeliners. 4.Help women with cancer look their best! Elizabeth Arden’s involvement with LGFB began at the program’s inception in 1988. To date the US market has contributed over 3.6 million dollars in donations and products. More than 700,000 women have participated in the LGFB program in the United States, which now offers 14,500 group workshops nationwide in more than 3,000 locations. To find out more about Look Good Feel Better, visit www.lookgoodfeelbetter.org.